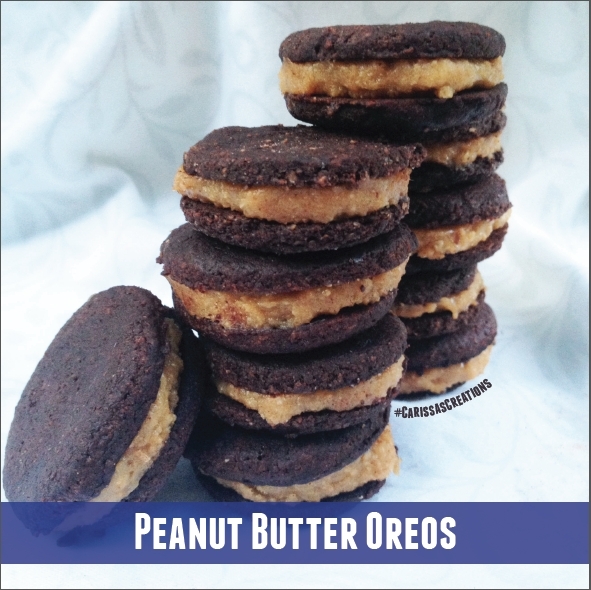 These "Oreos" are made with whole wheat flour and coconut oil and are sweetened with stevia instead of sugar and high fructose corn syrup like the original peanut butter Oreos. And oh my goodness, these "Oreos" are heaven and in no way lacking in taste. Preheat oven to 350 degrees. Combine all cookie ingredients in a bowl until thoroughly mixed together. Add more egg white if mixture is too crumbly. Form into a ball then chill in fridge for 30 min. After 30 minutes, remove from fridge and roll dough into 1/8 inch thickness on floured surface. Cut dough into Oreo sized circles. Get innovative if you don't have any cookie cutters - I used the lid of a honey container. Bake Oreo circles on greased cookie sheet for 10-15 minutes. My batch made 60 circles. While cookies are in oven, mix together the ingredients for the peanut butter filling. Once cookies are cool, put a small blob of pb mixture onto one cookie then sandwich another one on top. Continue until you have sandwiched all cookies together. You should now have 30 sandwiched cookies.